The Italian defender struggled for regular game time under Jose Mourinho, but is hoping to earn more minutes amid fierce competition under a new boss. Matteo Darmian has found game time hard to come by at Man United this season. 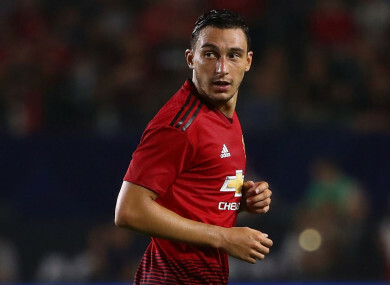 MATTEO DARMIAN IS happy to fill any role asked of him by Ole Gunnar Solskjar, having stepped into a centre-half berth for Manchester United, and is ready for a “massive” clash with Tottenham. The Italian, who struggled for regular game time under Jose Mourinho, was brought back into the Red Devils fold for an FA Cup third round win over Reading. That was his first outing since figuring in the 3-1 defeat to Liverpool which brought about a change in the dugout at Old Trafford. The 29-year-old has seen his future called into question on a regular basis of late, but he is looking for more minutes amid fierce competition for places at an ambitious club. Darmian told United’s official website of his outing in the centre of defence: “I can play there. He added: “We have 25 or 26 very good players. United’s win over Reading stretched their faultless start under interim boss Solskjaer to five games – seeing the club hit a 73-year high in the process. They are, however, about to face their biggest test yet, with a trip to Wembley Stadium to take on Tottenham set to be made on Sunday. Three more points in that contest would help to drag the Red Devils back into the battle for a top-four finish, with the importance of the fixture not lost on any of those in Manchester. Darmian added: “I think it’s a very good game and an important game for us against a rival. United are currently six points adrift of the Champions League spots, but still have 17 games in which to try and bridge that gap and force their way back to European football’s top table. Email “Darmian happy to play anywhere for Man United after being brought back in from the cold”. Feedback on “Darmian happy to play anywhere for Man United after being brought back in from the cold”.